The ALLERGY SHOP is a State of South Carolina fully Licensed, Bonded and Insured Heating & Air Conditioning Company plus General Contracting Company that specializes in Indoor Air Quality, Air Flow Engineering and Mold, Air Duct Cleaning, Remediation having successfully completed the Medical University of South Carolina, College of Health Professions, Program in Environmental Heath Science, Microbial Remediation – Design and Abatement. 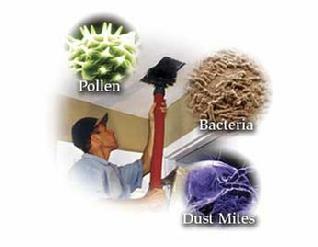 Air Duct Cleaning-Why Should I Clean My Air Ducts? Dirty airducts have been identified as a major source of indoor air pollution. Your ductwork system is an ideal breeding ground for bacteria, mold, mildew, fungi, and other health threatening organisms. Dust mites don’t typically live and breed in the air ducts themselves. However, dirty air ducts distribute the primary food source for dust mites — dust. Will My House Be Less Dusty After The Ductwork Cleaning Is Done? Yes, the inside of your ductwork is the equivalent of an extra room in your home that never gets dusted or vacuumed. When the furnace or air conditioner fan turns on, dust from the airduct gets churned up and blown into the rooms of your home. I Live In A New Home, Do I Still Need Air Duct Cleaning. 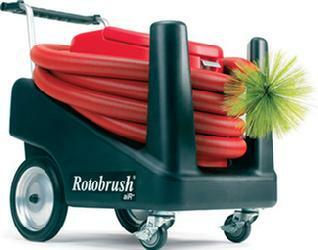 The equipment we use to clean the air ducts is called a RotoBrush which is effective in all types of air duct construction, including flex duct, round metal ducts, square metal ducts, and fiberboard. It can easily accommodate right angle turns and multiple bends found in most types of duct systems. Fully Self Contained HEPA Vacuum. No mess in the home! All of the air breathed in most homes and offices today must first travel through the Heating & Air Conditioning Ductwork.The ALLERGY SHOP uses State-Of-The-Art Duct Cleaning Equipment to sanitize ALL Duct-Work ranging from Ships to Operating Rooms and Private Homes.Because our Video Guided “3G” equipment is completely friendly with the “Flexible” type Duct Work found in most of today’s homes – there is no danger of damaging it. Our High Efficiency Particle Arresting [HEPA] Vacuum System safely removes all contamination from any environment without making a mess in your home. A common complaint called “DIRTY SOCK SYNDROME” is a strong indication that the Air Conditioning and related Ductwork System is in need of cleaning. The name is derived from the odor best described as coming from dirty socks.